Scientific Illiteracy After the Shuttle: Are America's Smartest Days Behind Her? Still, the free and brave idea was exactly what was on my mind last week when I was at the Kennedy Space Center for the final launch of NASA's space-shuttle program. It's hard to watch 4.5 million pounds (about 2 million kg) of explosive machine lift off the pad with four human beings aboard and not be impressed by the pure brass it takes just to build such a monster, to say nothing of being willing to climb into it. And it's hard to look around at the thousands of reporters and hundreds of TV cameras reporting every moment of the event  in real time, to the whole globe  and not reflect that the First Amendment was an awfully nifty idea. Last week's mission isn't the only thing about NASA that gives me a love-of-country charge. Even as the latest group of American astronauts run their final laps around the planet, a swarm of unmanned probes are continuing to explore the solar system: Cassini, Messenger, the Spirit and Opportunity rovers, Voyager 1, Voyager 2, Dawn, Express; all are either on their way to or have already arrived at such diverse destinations as Saturn, Mercury, Mars, Pluto, the asteroid Vesta and, in the case of the Voyagers, the interstellar space beyond out solar system altogether. Two more probes  Curiosity and Juno  are queuing up for launch later this year to Mars and Jupiter. And every single one of those machines is wearing an American flag on its hull. It ain't "U.S.A.! U.S.A.!" chest-thumping to find that worthy of more than a little national pride. The problem is, the land of the free and home of the brave is in danger of becoming  not to put too fine a point on it  the land of the dunderhead, and my trip to Cape Canaveral, Fla., drove that point home. It's no secret that as a people, we're rapidly losing the basic fund of knowledge we need if we're going to function well in a complex world. Just last week, another dispiriting poll was released revealing how little some of us know about our national history. Only 58% of Americans can say with certainty what happened on July 4, 1776  a figure that falls to a jaw-dropping 31% in the under-30 cohort. Fully 25% of Americans who do know that we seceded from some country or another to become a nation don't know what that former parent country was. This follows on the heels of other polls showing similar numbers of folks believing that we fought the Russians in World War II and beat them with the help of our stalwart German allies. Being historically illiterate is bad. Being scientifically illiterate, however, is even worse  if only because having a working knowledge of how the world operates is essential to understanding critical areas of national policy. Type the words "global warming" and "hoax" into Google and you get an appalling 10.1 million hits. The polls are all over the map on this one, but they show that rising numbers of Americans think climate science is fraudulent or exaggerated  up to 41% in one survey. It's not merely opinion to say that those people are simply wrong. There may be raging debates among scientists about the precise severity, mechanisms and trajectory of global warming, but the basic science is established and accepted, whether you want to admit it or not. Then of course there are the 18% of Americans who believe the sun revolves around Earth and the 28% who think the moon landings were faked. Google that last one and you're taken to sites that profess to be forums for political debate. Political debate? About faking the moon landings? This isn't the Roman Senate, folks, it's fantasyland. What got me thinking about all this was a stop I made after the launch at the Kennedy Space Center Visitor Complex  a combination museum and theme park on the Cape Canaveral grounds. The center's special feature this season is called Sci-Fi Summer 2011  and it delivers just what it promises. Adjacent to the rocket garden, with its full-size mock-ups of the U.S.'s most legendary boosters, is a massive maplike display comparing the sizes of the Saturn 1B, the Saturn 5, the Mercury Redstone, the space shuttle and the International Space Station to the Starship Enterprise. Which is fine, except that all the other spacecraft actually existed and the Enterprise, um, didn't. The spacesuits worn by Neil Armstrong, Gordon Cooper and other astronauts are similarly commingled throughout the exhibit with uniforms worn by the Klingons and Romulons. There is also an entire pavilion set aside for a Star Trek display. O.K., it's cranky to begrudge people a little fun and Star Trek is undeniably cool. But do we really not get enough fun and cool elsewhere? Is there anyone alive who thinks that what Americans need right now are more ways to divert and amuse ourselves? Mix Cooper with the Klingons or the shuttle Enterprise with the Starship Enterprise long enough and the kids who consume all this stuff will no longer be able to tell them apart. Scientific literacy is part of good citizenship. And when it comes to space science, you don't need a lick of fiction to make it fun. An engineer at NASA's Jet Propulsion Laboratory who works in the interplanetary program once explained why he loves his job by saying, "If you can't have a good time coming to work and building robots to send to Mars, give it up, man." The same used to be true of merely learning about such things. It must become true again if the U.S. is going to keep its edge. 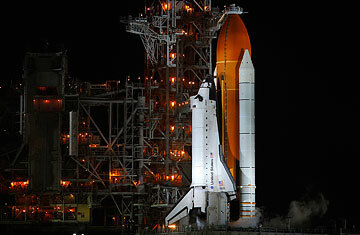 See a photo history of the space-shuttle program. See TIME's video "My Love Affair with Space."